I bought this gem because I had always wanted an old Beemer. These are phenomenal bikes. 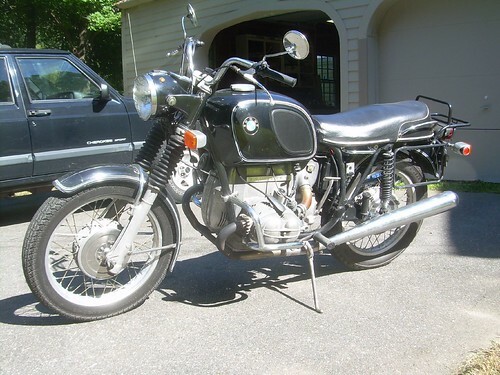 The slash 5 series were the first “modern” bikes from BMW. They had telescoping forks, reasonable handling, decent brakes (no discs yet), and motors that will outlive any owner. I bought this bike with about 91,500 miles on it and have put on thousands since. All the early R bikes (R50, R60, R75) were great touring platforms. They required less maintenance and were generally easier to work on then their Japanese counterpart. Early models came with the large 6 gallon tank, and the option to add on a bevy of additional touring accessories. My R60 is fitted with Krauser engine gaurds, as well as a Krauser luggage rack and saddlebags (saddlebags are not mounted for this pic). I absolutely love this bike. Runs and rides nice and smooth and I have absolutely no hesitation about taking it anywhere because I know it will never leave me stranded. I bought this bike on a whim because the price was right. It hadn’t been on the road for a couple years, but it at least started and ran and appeared to be reasonably safe. I gave it a 10 mile test run once I got it down off the trailer. It seemed to go ok, not great, but ok. So that night I flushed the oil. I then threw my saddlebags over the back of the seat, strapped on a suitcase and tent and left for and left for a roadtrip to Kentucky. I’m sure you are thinking that it’s a terrible idea to ride an old bike like this 1,000 miles without so much as checking bearings, but that’s just the kind of rider I am. . . reckless. Heh. It got pretty bad gas mileage, and only had a 3 gallon tank, but I managed to make it all the way to Kentucky. 1,000 miles in only 19 hours on the road. I wouldn’t say the bike performed beautifully, but it did perform. On the way back I ran into a couple minor mechanical troubles, as well as a hell storm of dense fog, torrential rains, and lighting. But I’ll get to that all next time. These old Honda CM’s are a decent little bike. They have that unusual half cruiser half standard design that was oh-so popular back in the early 80’s. All the Japanese companies were slowly shifting their design focus to try and be more in line with American demand. This of course means laid back cruisers, bleh. These Honda CM bikes, Yamaha’s XJ Maxims, Suzuki GS L models, and Kawasaki CSR bikes all have very similar styling. They are also all middle of the road bikes that offered no particular appeal to anyone and aren’t too stylish or well built. That being said. This bike does ride pretty smooth, and isn’t a terrible machine for what it is. It is now residing with a middle age woman who bought it from me as her first bike. And I must say, there aren’t many first bikes that are better than this. Low seat, reasonable handling, and smooth motor make this bike a comfy and easy ride to learn on. If only the sport bike babies with track dreams were into learning safely. It is unfortunate that this bike has no stand out characterisics. At least the CM400A had an automatic transmission to define itself. I sure do buy a lot of old Honda SOHC 4’s! These 550’s are solid little bikes. Small enough to zip around town on, and heavy enough to do some touring down the highway. Why people don’t look to buy bikes of this size today I have no idea, they are far more practical than many modern bikes. 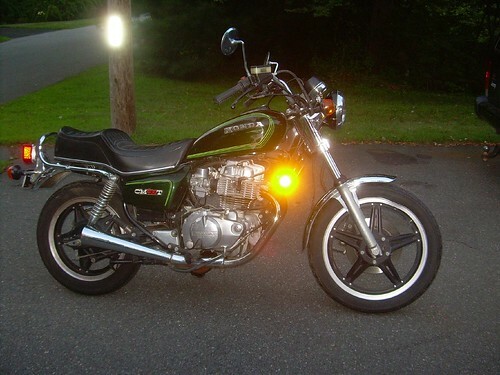 A first year F model CB750. The F bikes had a number of differences from the standard K model. All the body work was redone and made to look sportier. The tank is longer and sleeker, the seat has a lower profile, and there is a rear cowl section. The exhaust was a 4 into 1 from the factory rather than a 4 into 4. The front blinkers were mounted lower and the bike did not have chrome headlight ears. The later SS models have the chrome headlight ears but the blinkers were mounted lower on the ears and had shorter stems. The SS forks were larger diameter as well. I’m not sure which year the F model cylinder heads got bigger valves, was it first year? Anyone know? These bikes also had a rear disc brake, the K model still used the drum. There were a few other minor differences between the K and F. This particular bike has a Dyna electronic ignition installed which makes for a very strong spark, and no more adjusting the point gap and sanding the point faces! 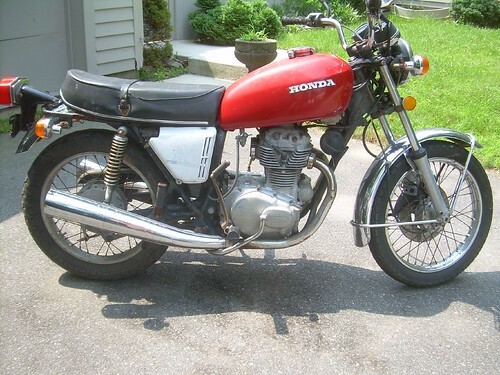 These 350cc inline 4 cylinder bikes were produced from only 1972-1974. They are quickly becoming a very popular and in demand collectible due to their short production run, and the difficulty of finding an unabused example. However, I have found an excellent example and trailered it home. This bike is in near emmaculate condition without a dent or scratch on it. The original!!!! paint looks flawless. There are only 2 problems with the bike. The one that detracts significantly from the value is rust where the mufflers meet the headers (very common for older 4 into 4 systems, particularly this specific model). It is not properly repairable without replacing the mufflers, which are otherwise in excellent condition. The other issue that detracts the collectors eye are the stickers on the tank. While these can be removed with a little patience, the paint is slightly darker underneath so their outline remains. I think they’re kind of cool though! I was reading through the classifieds for motorcycyles today, as I frequently do. 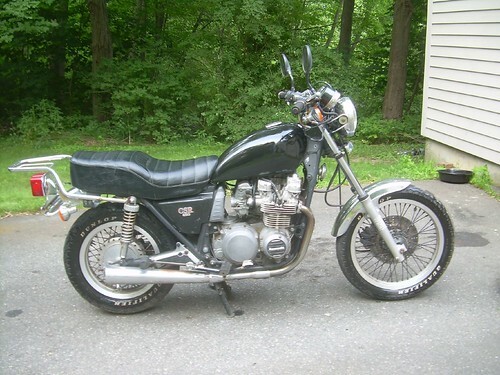 I came upon someone selling a 1977 Honda CB750A(utomatic). In the listing they claimed it was the only automatic motorcycle ever built. I couldn’t resist giving them some additional information. Just a little information. 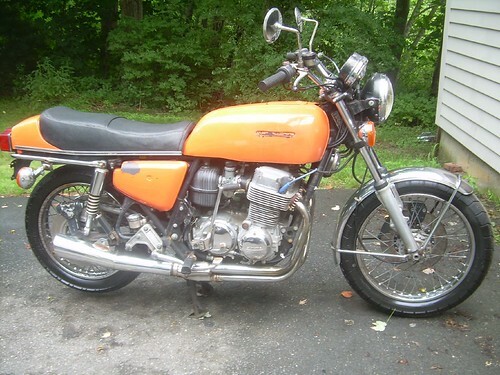 The CB750A was in fact the first automatic motorcycle built for the street. However it is not the only automatic motorcycle ever built. The first automatic production bike (I believe) was the Rokon 338 which was an off road bike debuted in 1973 and manufactured in America. It used a centrifugal clutch and a single gear. 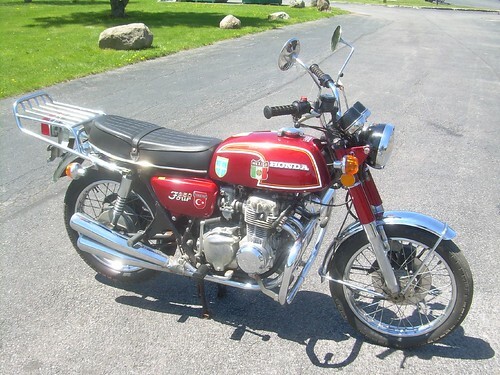 The CB750A was released in 1975. 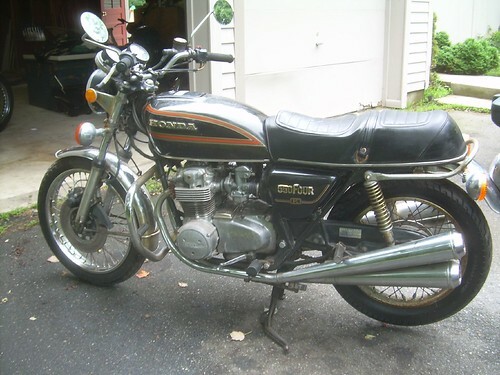 Honda also created Hondamatic motorcycles in 1979 (CM400) and in 1982 (CM450). The 400 was produced for 3 years, and the 450 was produced for 2 years. Other automatic motorcycles have existed with less popularity. Husqvarna produced an automatic motorcycle somewhere around 1984-85. I’m sure there are many other bikes with automatic transmissions probably dating back as far as the early 20th century. Some may argue that a centrifugal clutch driven bike is not a true automatic transmission, and to that I would say: The sliding gears inside the automatic Honda street bikes are not true automatic transmissions either. Who cares! If you don’t have to shift or use the clutch, it’s automatic! Within 24 hours I had the bike repainted, shined up, and running. Certainly not a perfect bike or a quality restoration job, but it is a fun little bike that makes LOTS of noise due to the mufflers being hollowed out. 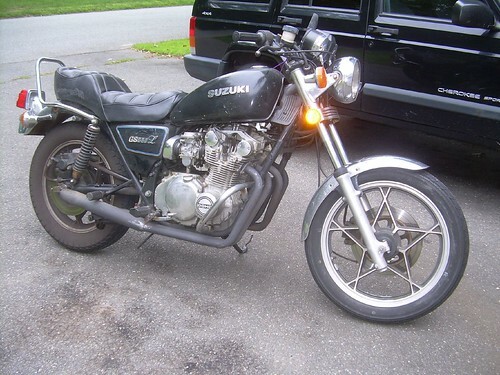 I picked up this bike for an incredible deal (in non-running condition of course!). I have always liked the small bore honda twins. 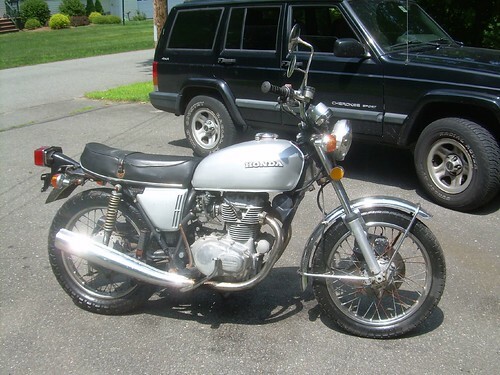 The cb350 is one of the greatest bikes of all time. The 360 is actually quite a different motor. Why they made all the changes I’m not entirely sure.